Amy Cilimburg (left) earned a Masters in Science in Wildlife Biology from the University of Montana, Missoula, in 2001 studying Yellow Warbler demography. 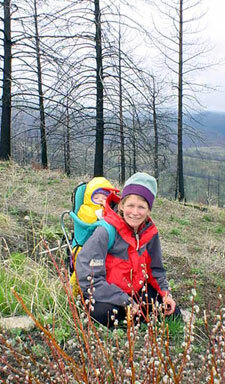 When not working as a Program Director for the Avian Science Center, she takes daughter Wren on backpack tours of recently burned forests. Karen Short (right) received her bachelor's degree in Wildlife and Fisheries Science from the University of Arizona, Tucson, in 1996. She completed a doctoral program in Organismal Biology and Ecology at The University of Montana, Missoula, in 2003. Her dissertation describes the effects of prescribed fires on plants, insects, and birds in southwestern ponderosa pine forests; see a short article, A Bird's Eye View that describes her research. Amy and Karen began this web project as Science Fellows through a science minigrant from Environmental Defense. They are currently seeking additional funding in order to both continue to expand and update this site. Suzanne Lingle helps with web develpoment and consultation. See more of her web design talents at Tzeal Graphics.